As a working makeup artist, I hear daily from at least one client that she only uses bronzer during the summer. Many — like her — believe that bronzer is best used to create a “fake tan” appearance on the face. If someone doesn’t have a real glow, and wants to create the illusion of warmth in the summer months, bronzer is an excellent resource. But it’s simply not true that bronzer is only to be used just three months out of the year. Some credit Guerlain with creating the first bronzer on the market 30 years ago, when the brand launched its iconic Terracotta Powder. The intent of this product was to “naturally reproduce varying shades of the sun, offering women an instant natural glow, at any time of the year, in one quick, easy motion.” Key phrase: any time of the year. While applying bronzer to fairer skin tones might seem like a logical solution during the summer, consider bronzer to be your friend all year long, regardless your skin tone. Most importantly, for those with olive or deeper complexions, bronzer is an essential product to create a sculpted look. After working in the beauty industry as a professional makeup artist for over a decade (and even though bronzer has been around most of my lifetime), I always ask clients before I apply it. Many women will adamantly refuse bronzer, for fear of looking orange. I completely understand: as this category flooded beauty counters in the late ‘80s and ‘90s, some formulas were imperfect. A few early bronzing products tended to deliver an orange cast to the skin that was unmistakably makeup — and difficult to pass off as sunkissed. This look gave bronzer a bad name and scared women worldwide. I am here to tell you that your fears of looking like Garfield the Cat can be laid to rest. Technological advances in cosmetics have corrected those early snafus, and most bronzers today will do nothing but make you look like you just got back from St. Barts. When looking for your best bronze shade, there are two aspects to consider: the look you are going for, and your natural skin tone. Let’s dive into the look first. When starting your bronzer shopping journey, browse magazines or scroll through Instagram, taking note of what selfies or celebrity images you find the most appealing. For example, if Jennifer Lopez’s radiance is what you hope to replicate, consider creamy formulas with glow and shimmer. If you prefer a more subtle, natural look like that of Gwyneth Paltrow, opt for a soft, matte powder. Once you decide whether you like a luminous appearance or not, you’ll have weeded out half of the products on the market. Now, you have to find the right color match for you. If you are fair, it is so important to choose formulas with a very light warmth — more of a peachy tone than brown. That’s because traditional, browner shades that are typically offered in the bronzer aisle may look muddy and fake on you. You might even want to consider using an earth-toned blush to add a glow — play around with shades in this color family to see what looks the most natural. My favorite formula for lighter skin tones is Laura Mercier Matte Radiance Baked Powder ($42) in Shade #2. Though it is matte, its baked formula provides a soft radiance to the skin. Because there’s no orange in this product, it’s the perfect shade for lighter skin tones. If your skin tone is deeper or more olive, look for deep tones that have more red than orange as their base color. As a makeup artist, my secret weapon is foundation powder or bronzer meant for the deepest skin tones — it creates a very realistic look. The iconic Guerlain formula comes in a shade called Intense ($49) for those who have deep complexions and cannot find a bronzer that appears on their skin. I also like Bobbi Brown’s bronzers for darker skintones, particularly the brand’s Bronzing Powder in Deep ($44), which has a deep red-bronze undertone. 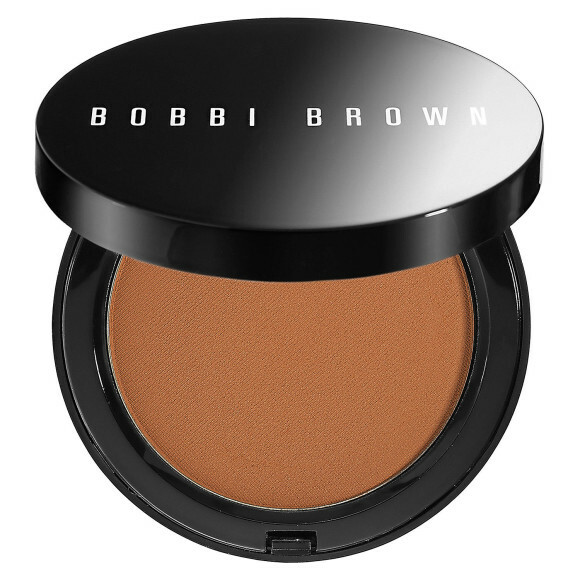 I use this shade for just about every bride for the perfect contour color, and for warmer skin tones, it works perfectly as an all-over matte bronzer. The proper application is essential to create the most realistic look. When bronzer was first invented, we were introduced to the “bronzer brush,” a fat brush with dense bristles that allowed for all-over face application. You can still use these, but they’ll create more of a one-dimensional look. We have learned many makeup lessons since the ’90s — and there are lots of better application methods to choose from today. If you use a smaller or medium-sized brush with the “3” method, you’ll achieve a more contoured look, which is popular today. That creates glow and warmth in the skin while accentuating the angles of the face, while simultaneously avoiding an over-bronzed look. It’s when you are done strategically applying most of your product in the “3” that you can apply bronzer all over your face. Simply use whatever is left on your brush to dust a little bit of bronzer across your skin. Because of your hard work sculpting, you’ll look radiant, but not flat. You now know that bronzer can add soft angles and contours to the face — but they can also be used to accentuate your favorite features and downplay those that might bothers you. For example, if your face is very round, you can add bronzer more heavily to the sides of the face, which will create an illusion of thinning it out. For those who feel like they have a large forehead, try applying your product along the hairline, which will shorten the forehead. You can also slim a bigger nose by adding your favorite formula to the bridge and sides. This can make your nose appear shorter. When you consider bronzer an option all year round, the possibilities can seem endless. Keep yours in your makeup bag after Labor Day this year — and reap all of the benefits a bronzed life has to offer.